Rope Halters -Do you need one? Please note: This is just my opinion. Lots of good horsemen will agree, some will disagree. My hope is that you will decide for yourself based on what makes sense to you. Rope halters are “in” right now. Seems like lots of big trainers are using them, so they must be great, right? Well, you decide. We are told a rope halter gives the handler more “feel” and the horse responds quicker. Wonder why? You should. Here’s what I see. First, I don’t know what “feel” is. Well, I do have a pretty good idea what is meant by the term, but I prefer more concrete words. I don’t care for words with ambiguous meanings such as “jigs” “attitude” and “timing”. I prefer to say the horse “trots”, “tosses his head” and “release the rein when he turns left”. Those make more sense to me. Now about those halters. Think about pressing the palm of one hand against the back of your other hand with about 1 pound of pressure. Now imagine that same 1 pound of pressure exerted on a wire across the back of your hand. Which hurts more? The wire, of course. Why? Because the pressure is concentrated over a small area, only as big as that wire. If you spread the same amount of pressure over a larger area, such as the palm of your hand, it doesn’t hurt at all because it is a larger weight-bearing area. So, a halter made of small diameter, round rope, especially if it has little knots over the nerves in the horse’s nose, has much less weight bearing area than a flat, 1” wide halter. Therefore, it is more severe. The flat, wide halter will be more comfortable for the horse. Now about “feel”. As I said before, I don’t know about “feel”, but I do know what a horse looks like who is rushing to try to avoid pain. And that’s what I see when a horse responds quickly to a rope halter. It hurts. Sometimes there is a heavy snap under the chin of a rope halter and a “wave” is sent down the lead from the handler to the horse. When the “wave” gets there, it slaps that heavy metal snap up against the horse’s bony jaw, followed by the rope banging down on his nose with all the weight of the snap jerking on it. Ouch. The horse jumps – it hurts. He probably also raises his head, tenses his neck, and some horses, after a few of those “waves”, will begin rearing. Is this what I want to teach my horse? 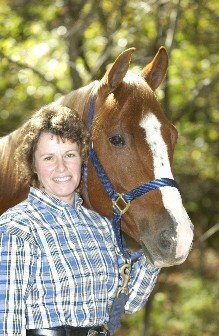 I’d prefer to teach my horse to give to a little pressure using that comfortable flat, wide nylon or leather halter. Then he’s relaxed, I’m happy, his head isn’t in the clouds, and his feet are on the ground. That’s how I want to spend time with my horse, not causing him pain. So you choose whether you want to go with the current fad, or decide for yourself. If you would like to learn how to get your horse to respond to light pressure using a comfortable halter, we teach that and more at the Apprenticeships.